Yvette always seems to be doing something in the line of performance. From singing, jazz, blues, and gospel. More often than not, she’s either doing one or any combination of the following: performing, singing, multi-media, and mentoring. Holding a full plate in performing arts and her torch held high, she shows no signs of letting her idea of being “keeper of the flame” die down. She is currently a part of the Page to Stage musical showcase of BLACKBERRY DAZE which is presented at Metro Stage from September 1-October 9 www.METROSTAGE.com in Alexandria, VA, directed by Tom Jones II. 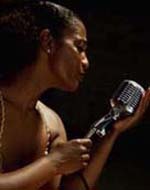 Yvette, along with her cast members wowed the audience with their “high intensity" approach to the voices of Gospel and Blues that assisted in telling the story of a murder mystery taking place in the key of Blues. As if Jazz was not enough, Yvette’s belief in the "All Power of God" also yields her voice to the worship house lifting praise!!!! Growing up in New Orleans, Louisiana with strong traditional values. I find it hard to call any other place “home”. New Orleans is deeply planted into every fiber of my being. 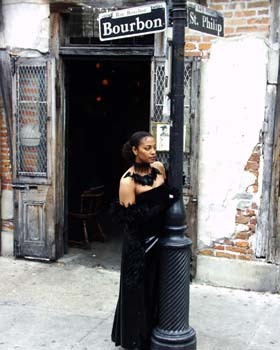 New Orleans is a part of every word I speak, every song I sing, and everything I do. Bayou born and raised, blessed with this incredible desire to perform and be as festive as I was brought up to be. Saying “no” to any opportunity to share my talent has been the only difficulty that I have encountered in my desire to be “a keeper of the flame”.